Q: I am jealous of my friend’s waterfall. Where do I start? A: Waterfall envy. We’ve all experienced it. It’s that feeling you get when you see those stunning synchronized fountains at the Bellagio in Las Vegas, some over-the-top displays during your local pond and garden tour, or your pal’s 15-foot 20,000-gallons-per-hour jaw dropper. You think, wow, I want that in my backyard! Let’s turn that jealousy into motivation. With some planning, some equipment and a weekend (or two) of hard work, you can create a waterfall that will rival the others in your neighborhood. Here’s how. Before you begin, think about how much money you want to spend and then work to develop a project budget. In most cases, the larger the waterfall, the more expensive it will cost—but some of those top-of-the-line accessories for smaller features can cost quite a bit, too. If you need some help, call a pond-building professional in your area who can assess your needs and suggest a starting point. You’ll also want to consider how much room you have for your waterfall. Do you want to add a new feature to your existing pond? Alternatively, are you planning to build one from the ground up? In either case, how large will it be, and where will it go? 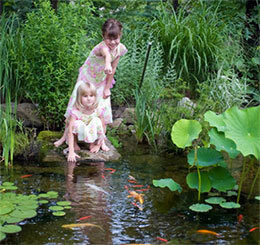 Make sure that it’s sized appropriately for your pond and/or yard, and position it in a place where you can enjoy it. If you have an existing pond and want to add a waterfall while changing the look of the water’s flow, check out the ClearSpring™ Waterfall Filter. Not only does it provide maximum year-round filtration to your pond, but it also offers two weir options – a smooth surface and a ribbed pattern – to add diversity to your water feature. Another option is to increase your existing flow rate by bumping up your tubing size and pump size. More water and increased movement can make dramatic impacts in your water feature, and it’s an easy adjustment to make with some plumbing and pump swaps. Finally, think about how much time you realistically want to spend maintaining your water feature. Are you a weekend warrior with a full-time job, or do you have a busy family with soccer games every weekend? If so, you may not have a lot of time to spend on weekly and seasonal maintenance chores, like leaf netting and winterizing. A Pondless Waterfall Kit is an excellent solution. It provides the sights and sounds of running water with little maintenance. If you have more time on your hands, consider adding a self-enclosed pond with pops of color to your landscape. The Colorfalls Basin Kit with Color Changing Waterfall Weirs is an easy-to-install system that includes a reservoir, the plumbing, the pump, all the fittings, double filtration, splash mat and even an automatic fill valve. The color changing weirs feature 16 patterns and 48 color options – which should be enough to make your friend jealous! Pond Talk: What’s your favorite waterfall – real or human-made?